Midmark Corp. announced it has finalized the move to the company’s new corporate headquarters at Austin Landing. DAYTON – Midmark Corp., a leading provider of medical, dental and veterinary equipment solutions, announced it has finalized the move to the company’s new corporate headquarters at Austin Landing. Located at the corner of Penny Lane and Rigby Road (10170 Penny Lane, Suite 300), the 12,000-square-foot workspace is a cornerstone of the company’s transformation from an equipment manufacturer into a clinical environmental design company. In August, Midmark launched a new corporate brand identity that captures the company’s commitment to a better care experience and speaks to the growing value Midmark provides to customers in the rapidly changing health care industry as it focuses on improving clinical outcomes. The new tagline, “Designing better care,” puts forth the idea that whether it is a doctor’s office, dental practice or veterinary clinic, better care starts with a better designed care environment, which leads to improved outcomes. 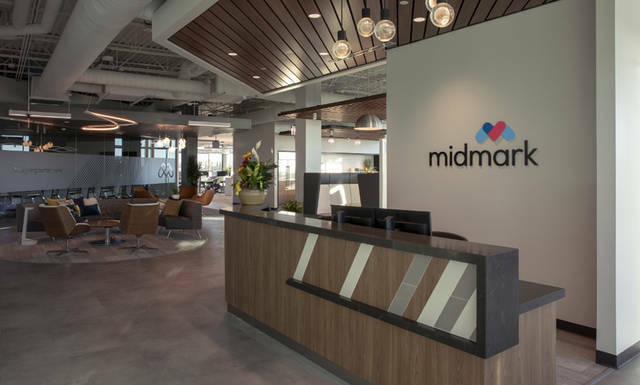 The new Midmark corporate headquarters is designed to make teammates’ jobs easier and more efficient by providing well-designed team neighborhoods, close access to colleagues and resources, less time in meetings, more time with customers, health and benefit resources and more. It features an open floor plan with a mix of workstations and conference rooms that offer ample private and collaborative spaces. The Versailles Midmark campus remains the company’s largest site, housing primarily manufacturing, associated support functions and the customer experience department, continuing its more than 100-year history of Ohio-based manufacturing. Midmark is preparing to break ground in Versailles for an expansion that will feature a new technology center as well as an experience center for customers and business center for teammates. The expansion is expected to bring 97 new jobs to the region.